Fraser Valley – You have heard about it for a few days now, and Environment Canada has made it official. 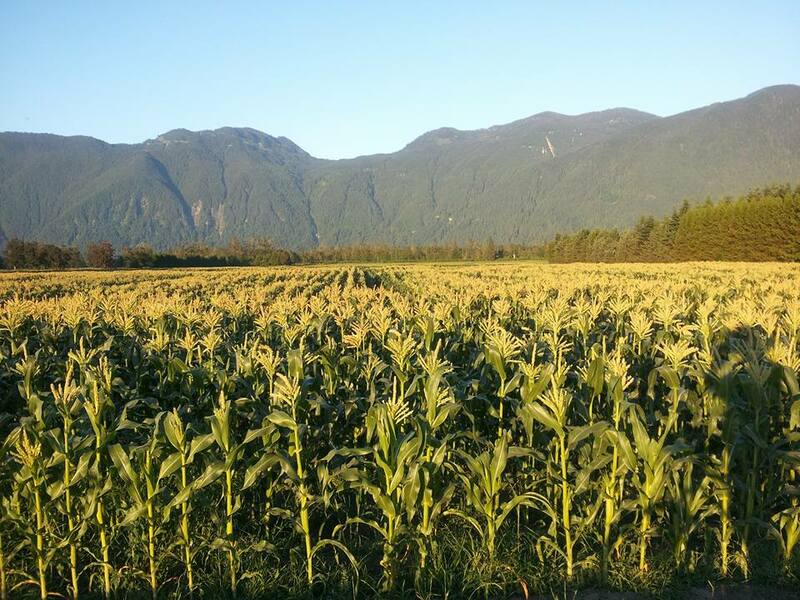 A special weather statement has been issued for the Fraser Valley, and the heat will make the Fraser Valley feel like Palm Springs. A massive ridge of high pressure will build over southern BC through Thursday, leading to several days of hot weather. 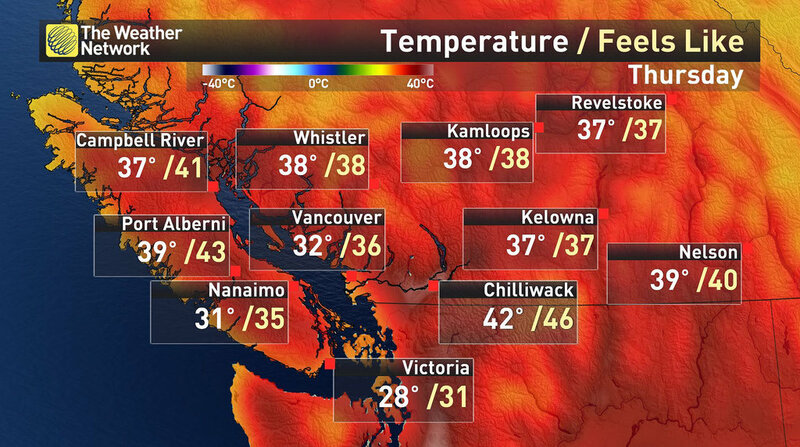 Daytime maximum temperatures will soar into the mid to upper 30’s through midweek over communities in the Fraser Valley, Howe Sound – Whistler and inland Vancouver Island. Temperatures will be several degrees lower near the Straits of Georgia and Juan de Fuca. Daily temperatures from Tuesday to Thursday will probably be broken in many communities. And the all time records for the month of August may be threatened, too. 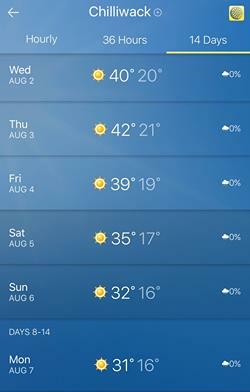 For example, the highest August temperature ever recorded at Abbotsford is 36.3 degrees (According to environment Canada, Weather Network calls it 38.0C) and the forecast for Thursday is 35. 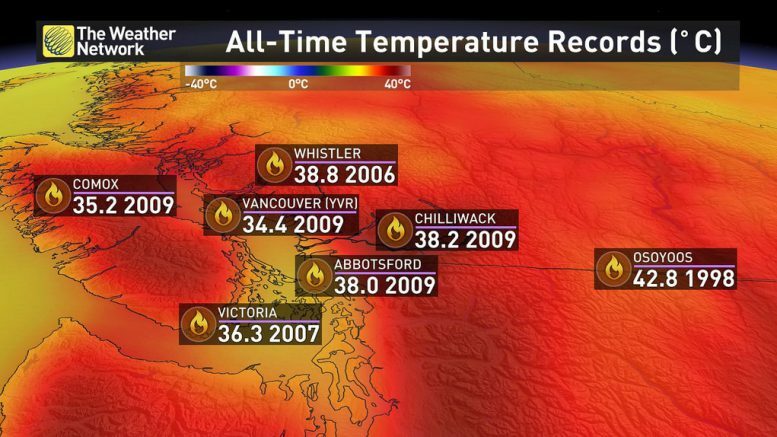 For Chilliwack, the all time August record and all time summer record is 38.2C. While the Environment Canada records for Chilliwack are actually taken in Agassiz, don’t be surprised is both Abby and the Wack flirt with 40C during the day and overnight lows of only 20C. The Weather Network predictions are a little higher than Environment Canada. It’s a broken record, but PLEASE be careful with cigarette butts. Refer here to the BC Wildfire Service for updated Fire Danger Ratings. Be the first to comment on "Record Breaking Heat This Week"